Are you in high school and ready for a robotic challenge? Join high school students from around the province to compete in the 11th annual Robot Rumble at Sask Polytech in Saskatoon. We provide the SUMObot kits. You build and program the 'bot. Face-off in the ring and win! At the competition, you'll compete in the ring against another student-built SUMObot. The robot that stays in the ring the longest wins. You could win prizes and Sask Polytech tuition credit. Check with your high school to get involved and enter your team in January. $1,500 tuition credit to a Saskatchewan Polytechnic diploma program in the School of Mining, Energy and Manufacturing, a Samsung Galaxy Tab E and $150 cash. $1,000 tuition credit to a Saskatchewan Polytechnic diploma program in the School of Mining, Energy and Manufacturing, Beats by Dr. Dre Powerbeats 3 and $100 cash each. $500 tuition credit to a Saskatchewan Polytechnic diploma program in the School of Mining, Energy and Manufacturing, UE Roll2 portable Bluetooth speaker volcano and $50 cash each. Check out the competitions on Instagram, Snapchat or Twitter using the hashtag #RobotRumble! Learn more about careers in electronics and other Sask Polytech programs from the School of Mining, Energy and Manufacturing. $1,500 tuition credit to a Saskatchewan Polytechnic diploma program in the School of Mining, Energy and Manufacturing. $1,000 tuition credit to a Saskatchewan Polytechnic diploma program in the School of Mining, Energy and Manufacturing. $500 tuition credit to a Saskatchewan Polytechnic diploma program in the School of Mining, Energy and Manufacturing. Each team will consist of two grade 9 - 12 students and one robot. Team members must be Saskatchewan high school students registered in grades 9 - 12. Each school is allowed to register 2 teams. Additional teams may be submitted for registration, and will be accepted based on availability of space. Additional team acceptance will be prioritized on a first come, first served basis. Notifications of acceptance for your additional teams will be sent starting February 1. Sask Polytech distributes 25 robot kits each year. The robot kits will be distributed upon receipt of the high schools' completed registration form. Schools that have not participated previously will be shown preference provided they apply by the school registration deadline date. After this date, kits will be distributed in the order registrations are received until all kits have been allocated. Each high school will be provided one robot kit at no charge provided the school sends at least one team that registers to compete. Each kit contains two robots, which means each school could send two teams. If the school does not send a team to compete, the school can pay $280 for the kit or return it to Saskatchewan Polytechnic unopened. Modifications to robots will be allowed provided these modifications adhere to the rules specified in Section 6: Robot Requirements and Section 8: Compliance of the Saskatchewan Polytechnic Sumo Robot Competition Rules. Saskatchewan Polytechnic will not provide extra parts for modifications. If time permits, robots may be reprogrammed between matches. Teams will supply their own equipment for reprogramming. Rules and regulations for the Saskatchewan Polytechnic Robot Rumble sumo wrestling robot competition. The competition format, team description and the definition of the competition area are included. Teams register upon arrival at Saskatchewan Polytechnic on the morning of the competition. A flag will be supplied for each robot that identifies the robot's number, name and school. A tamper proof label identifying the robot's number will be attached to the robot. Both the flag and sticker must remain on the robot for the duration of the competition. Team will be assigned to a pool. Each pool will contain 7 to 12 robots based on registration numbers and determined by the Head Judges. All teams in each pool will challenge the other teams in the pool in round robin format. The morning schedule for each team will be provided at registration. Matches in the qualification round will start at 10:00 a.m. If a team does not show up for the competition all matches involving that team will be forfeited during the qualification round. The top teams from each pool will move to the semi-final round and the remaining teams will be assigned to the consolation round. The number of teams from each pool that will advance to the semifinal round from each pool will be determined by the head judges before the competition registration. There will be a break after the qualification round for lunch and a tour of the Electronic Systems Engineering Technology and Electronic Technician program facilities at Saskatchewan Polytechnic. Semifinalists will be assigned to one of four pools. One winner of each pool will advance to the final round. All teams that did not qualify for the semi-finals will be divided into eight pools. Each pool will be scheduled for single elimination play. The winners of these pools will advance to the consolation final. The winners of the consolation round will play off in a single elimination consolation final to determine the consolation winner. The winners of the semi-final rounds will compete in a single elimination final round. Places for the teams in the final round will be determined by a random draw. Final round play will determine first place, second place and third place for the tournament. The winner of each match is determined by the best two out of three battles. Each battle lasts for a maximum of three minutes. Matches are scheduled at three minute intervals. It has been our experience that battles rarely last longer than one minute. The time scheduled for each match will be used as a guideline. Judges may adjust the time that each match starts. One representative of each team will bring their robot into the competition area. Judges will verify the identity of the competing robots. The two competing robots will be placed along the shikiri line with the right wheel of the robot adjacent to the shikiri line. The team representatives will prepare to press the start switch on their robot. The judge will ask the team representatives to push the start switch at the same time. The judge may restart the match if the two robots are not sufficiently synchronized. Participants must back up from the outer edge of the ring before the end of the five second delay. The first robot to fall off the competition surface loses the battle. The winning robot will be awarded one yuko point. The team that scores two yuko points first wins the match. Both robots remain in a clinch with no movement for five seconds. Both robots follow the same orbit or periodic motion for five seconds. It is not clear to the judges that progress in the battle is being made. Both robots fall off the competition surface at the same time and a winner is contested. One robot stops moving for more than five seconds. A time limit of three minutes runs out. Coordinate the play at each ring of the competition. Keep track of the time of each battle. Decide the winner and looser of each battle. May raise concerns about participant or robot conduct during the competition. Has final decision in any ruling. The three teams with the most Yuko points at the end of the round robin play. The team(s) with the most Yuko points from the matches involving the tied teams. In the case of a two-way tie, the winner of the match between these two teams. If a tie still remains, the head judge will schedule single elimination matches between the tied teams, immediately following the qualification round. Robots can be built using the parts supplied in the kit by following the instructions included with the kit. Physical modifications or additions to the robots are permitted for this competition. Robots must include a start switch. Robots shall not move until five seconds after their start switch is pressed. weigh less than 500 grams. fit in a 10cm x 10cm x 10cm cube at the start of a battle. A robot may expand after the start of a match. Robots shall not separate into pieces during a match. Robot parts, with a total mass of less than 5 grams, may fall off a robot during a match. 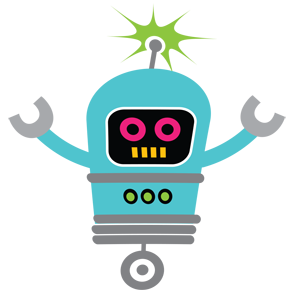 A robot is not allowed to intentionally expel any liquids, solids or gases. Robots may be reprogrammed between matches. Teams will supply their own equipment for reprogramming. Robots may not be reprogrammed between battles. You may not change the robots batteries between battles. Robots may not employ devices or methods intended to interfere with sensors of the competition. Robots shall not use parts that inflict damage to the ring or the opponent's robot. Robots shall not attempt to stick to the ring. Judges may place a robot on a piece of paper to test for violations to this rule. If the paper lifts when the robot is picked up, the robot will be disqualified. A team consists of a robot and a group of students in grade 9, 10, 11 or 12. Only one team member shall enter the competition area and place the robot on the ring. There will be a maximum of 120 teams in the Robot Rumble competition. All robots will be weighted on the following scale at registration. All robots must be under 500 grams. Judges will weight each winning robot after each of the competition matches. All robots must fit inside the 10cm x 10cm X 10cm cube at registration and at the start of each battle. Judges have the right to apply the cube at any time during the competition. The match shall be fought by two teams within the perimeter of the defined sumo ring. The ring is a black circular area 72 cm in diameter. The ring is surrounded by a 2.5 cm wide white border or Tawara. An empty space of at least 50 cm wide will surround the Tawara. The 27402 SumoBot Robot Competition Kit by Parallax allows you to build and program two high-quality SumoBot robots designed to wrestle in the mini-sumo competition ring. (included in the kit). Competitor packages will be consolidated into one bag for each school. The teacher/advisor can sign in for your school and distribute the package contents to your teams. door prize draw slip(blue slip)-please fill this out and drop it into the draw box located in the gym by 10:00 a.m. Door prizes will be drawn starting at 10:00 a.m. and will continue throughout the morning until noon. event evaluation (yellow sheet) and a pen-please complete the evaluation at the end of the event, and upon leaving return it with your name tag to be eligible for the final draw. Once competitors have their packages they can proceed to the inspection tables to have their robots inspected and tagged for the competition. Please make your way into the gymnasium and set up at any of the tables. Students will be escorted to the Electronics Systems Engineering Technology area located on the 3rd floor of the campus for lunch. Please follow the directions of the staff around 12:00 p.m., a pizza lunch with a vegetarian option will be provided. As we may not be able to accommodate all dietary restrictions, students with specific food requirements are encouraged to provide their own lunches. Championship flight and Consolation rounds. Parking is provided for participants at our event parking lot located east of the main campus on 33rd Street. Please refer to the map for directions. The lot will have signage and a commissionaire to guide you to the proper area. You may park in the visitor lot at the corner of Idylwyld and 33rd St., however this is a pay lot and there is a charge to park here for the entire day. Follow the directions at the pay station located at this lot. Parking in the staff parking lot or in the student parking lot is not permitted during the competition. In March 2009, Saskatchewan Polytechnic introduced the Robot Rumble SUMObot Challenge. The event was a smashing success. With $11,000 in tuition money and iPods up for grabs, electronics programs at Saskatchewan Polytechnic campuses in Moose Jaw and Saskatoon hosted more than 160 high school students for their first-ever SUMObot robotic competition. Saskatchewan Polytechnic provided the schools with a robot kit that contained enough parts for two SUMO robots. High school teachers worked with their students to build, program and test their robots. At the ninth competition in March of 2017, almost 200 students from forty-nine high schools across Saskatchewan registered for the competition. Sask Polytech's Robot Rumble competition gives high school students, working in teams of two, the chance to demonstrate their problem-solving skills, technical knowledge of electronics and teamwork as they competed against other students from across the province. Similar to traditional Japanese sumo wrestling matches, two SUMObots face-off against each other in a ring. The goal is to stay in the ring while pushing the opposing robot out of the ring. The robot that stays in the ring the longest wins the match. The top prize for the competition was a $1,500 entrance award and an iPod Touch for each team member. While the focus of the event is the competition, students also have the chance to tour Saskatchewan Polytechnic School of Mining, Energy and Manufacturing, such as electronics programs. Students will gain knowledge of potential careers in the field of electronics and telecommunications. Sask Polytech electronics grads work with business, industry and government employers in areas such as manufacturing, communications, resource processing and consulting. Prize:$1,500 tuition credit to a Saskatchewan Polytechnic diploma program in the School of Mining, Energy and Manufacturing, a Samsung Galaxy Tab A and $150 cash each. Prize: $1,000 tuition credit to a Saskatchewan Polytechnic diploma program in the School of Mining, Energy and Manufacturing, Beats Solo2 headphones and $100 cash each. The following sponsorship recognition would be provided. If confirmed prior to October 23rd, Presenting Sponsor's logo to appear on electronic and print information sent to all Saskatchewan high schools throughout Saskatchewan. Presenting Sponsor's logo to appear on the Saskatchewan Polytechnic Facebook events page and the Saskatchewan Polytechnic webpage advertising the event. Up to 5 invitations to competitors' luncheon. The Presenting Sponsor's name and logo to appear on signage at the event. Presenting Sponsor is given the opportunity to provide representation of their organization to act as judges at the competitions, or to assist in on-site organization. Opportunity to display two banners at the event. Opportunity to display corporate products and/or services at the campus during the event. First right of refusal for Presenting Sponsorship for two years following the first year of partnership. Campus sponsorship's logo to appear on the Saskatchewan Polytechnic Facebook events page and the Saskatchewan Polytechnic webpage advertising the event. Opportunity to address participants prior to competition. Up to 5 invitations to the competitors' luncheon. Participating Sponsor is given the opportunity to provide representatives of their organization to act a judges at the competitions, or to assist in on-site organization. If participating as judges, Saskatchewan Polytechnic will provide training to the sponsor's volunteers. Opportunity to display one banner at the campus during the event. Opportunity to include products, items and materials in all participant registration kits. First right of refusal for luncheon sponsorship for two years following the first year of partnership. Luncheon sponsor's logo to appear on the Saskatchewan Polytechnic Facebook events page and the Saskatchewan Polytechnic webpage advertising the event. Luncheon sponsor's name to appear on signage at the luncheon on the campus with which they are partnering. 5 invitations to the competitors' luncheon at the campus. Luncheon sponsor given the opportunity to provide representatives of their organization to act as judges at the competitions, or to assist in on-site organization. If participating as judges, Saskatchewan Polytechnic will provide training to the sponsor's volunteers. Opportunity to display one banner at the luncheon on the campus during the event. Opportunity to display corporate products and/or services at the luncheon on the campus during the event. Robot Sponsor's logo to appear on the Saskatchewan Polytechnic Facebook events page and the Saskatchewan Polytechnic webpage advertising the event. Opportunity to display one banner on the campus during the event. 2 invitations to the competitors' luncheon.